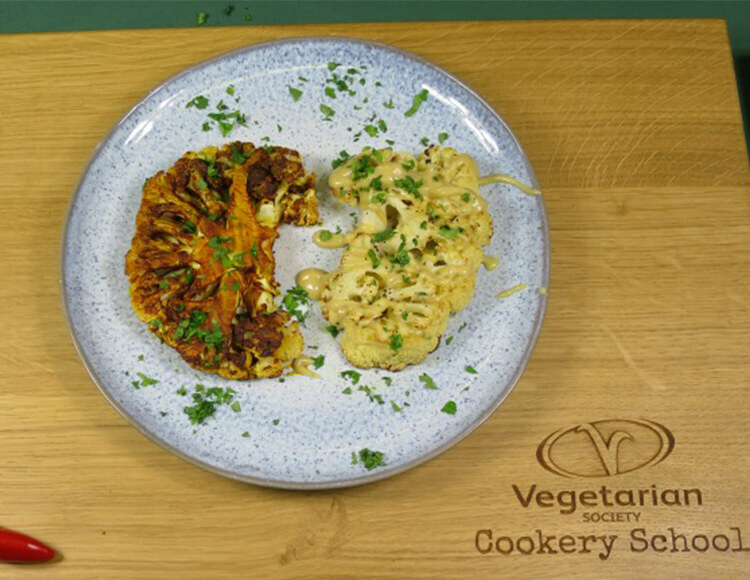 Pre-packaged cauliflower steaks are in the news this week but you can make them cheaply and free from packaging with our ‘how to’ film and recipe from the Vegetarian Society Cookery School. Got a cauliflower? Try making these cauliflower steaks! Large cauliflowers work best. Wash the cauliflower and remove leaves. Carefully trim stalk so the base sits flat on the work surface. Cut into chunky cross sections of about 4cm. The outer most sections will fall apart as not connected to the stalk (save these for use in another dish). The Vegetarian Society Cookery School loves getting people in the kitchen for a fun, hands-on and informative cooking experience in a friendly atmosphere. Based in Greater Manchester the school attracts people from all over the world.